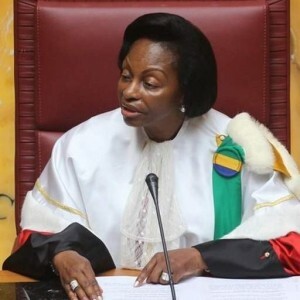 On 14 November, Gabon’s Constitutional Court president Marie-Madeleine Mborantsuo announced a constitutional amendment addressing instances when the president is ‘temporarily unavailable’. This is to accommodate the absence of President Ali Bongo Ondimba who has been hospitalised since reportedly suffering a stroke on 24 October in Saudi Arabia. The amendment is viewed as unconstitutional by civil society and the opposition, and the African Union (AU) has also expressed its concern. With the country at a standstill, Prime Minister Emmanuel Issoze-Ngondet asked the Constitutional Court in early October to invoke articles 13 and 16 of the constitution. He asked the court to authorise the vice-president to hold a cabinet meeting – a role reserved for the president. Neither article 13 nor 16 gives the Constitutional Court this prerogative. Article 13 provides for situations when there is a power vacuum for any reason or when the president is permanently incapacitated. If this happens, the Senate president should assume the position until new elections can be organised. Article 16 states that only the president can call and preside over cabinet meetings, unless he expressly delegates those responsibilities to the vice-president. The opposition has denounced the violation of article 16 by Mborantsuo – who is also Ali Bongo’s mother-in-law – and is seen as an instrument of the regime. She claims this is a ‘temporary’ amendment to find an ‘interim solution to a question which is not addressed by our constitution’. Civil society leaders insist the constitution only allows the court to interpret the constitution, not change it. They believe the court should have limited itself to interpreting article 13. The constitution can only be modified or amended by referendum or a vote by both chambers of Parliament (National Assembly and Senate), says Jean-Gaspard Ntoutoume Ayi of the opposition party Union Nationale. By seeking the court ruling, the government effectively recognised the president’s incapacity to continue holding office, while also refusing to follow the constitution’s guidance and apply article 13, he argues. This would have seen the president of the Senate assume the position and organise presidential polls within 30 to 60 days. Critics believe this is intended to allow the ruling party to retain power. The regime wants to avoid an interim presidency leading to elections it fears it could lose. Others think the ruling party is delaying to find a successor for Ali Bongo. The court’s decision has plunged the oil-rich nation into uncertainty, threatening the viability of democratic institutions and the country’s stability. It is the latest in a litany of decisions by the Constitutional Court in favour of the ruling Gabonese Democratic Party, which has been in power since 1967. Following the death of former president Omar Bongo Ondimba, who ruled for 42 years, his son Ali took over as president in highly contested 2009 polls marred by irregularities. Post-electoral violence ensued and the court ruled in favour of Ali Bongo. In the August 2016 presidential election, the court again declared him the winner, despite widespread fraud documented by, among others, a European Union observer mission. Gabon’s current institutional instability stems from the disputed outcome of the August 2016 presidential polls. These elections resulted in the postponement, on several occasions, of legislative elections initially scheduled to take place in October 2016. The Constitutional Court dissolved the National Assembly in May 2018, handing (some) power to the Senate until legislative elections took place in October. The new National Assembly has yet to be sworn in, as Ali Bongo fell ill right before the second round of legislative elections. According to the constitution, when the National Assembly is inaugurated the government resigns and a new government is appointed by the president. This is not possible when the president is absent; nor can other important decisions and texts be approved, which leaves Gabon in an institutional dilemma. Successive Constitutional Court decisions have essentially undermined the very fabric of Gabon’s society by violating the constitution. At the AU extraordinary summit on 17 November Rwandan President Paul Kagame – the current AU chairperson – wished Ali Bongo well. This was followed by a communiqué from AU Commission chairperson Moussa Faki Mahamat expressing concern over the situation in Gabon and reaffirming the ‘African Union’s strong commitment to the full respect of constitutional order in the country’. Mahamat’s communiqué amounts to a subtle condemnation, in diplomatic terms, of the constitutional amendment. This is in line with the AU’s African Charter on Democracy, Elections and Governance, signed by Gabon. Mahamat also announced the imminent deployment of a fact-finding mission to Gabon. The Gabonese government, through its Minister of Foreign Affairs Regis Immongault, insisted that Gabon’s institutions were robust and functioning as they should. He thanked both Mahamat and Kagame and said his government would only welcome the AU mission on agreed terms and at a later stage. Had the AU taken strong measures on the partiality of the Constitutional Court in Gabon in 2016 (or even in 2009), the erosion of democratic institutions in the country – including the current crisis – could have been prevented. Inaction will only lead to more instability. The AU faces the dilemma of a member state violating the institution’s values while invoking its sovereignty. The AU does however have the tools to prevent the erosion of democracy and the rule of law in its member states – and it needs to used them. This will require other member states to take strong action, including possible sanctions, to re-establish constitutional order in Gabon. The repeated flouting of the constitution has undermined Gabon’s institutions, harmed its people, and added to the upheaval in an already unstable Central African region. This article is written by the ISS PSC Report and was first published here.